The articles below are organized alphabetically by title. A second page of articles begins here. Some more excellent articles posted at other sites can also be accessed from a page in Portland NORML's links section. Portland NORML also maintains an immense archives of other news articles here. Other articles and news specific to Portland and Oregon from 1995 through 1997 are linked to Portland NORML's All Politics is Local page. More information about the crisis in Portland and Oregon funding for public education and other services, and the need to pass the Oregon Cannabis Tax Act, is linked to the Oregon Services Plundered for Drug War page. Historical news items about past efforts to reform marijuana laws in Oregon will be accumulating at a page documenting the History of Oregon Reform Efforts. American High Society, a subchapter from "Hemp: Lifeline To The Future," by Chris Conrad. Dr. Burke, president of the American Historical Reference Society and a consultant for the Smithsonian Institute, counted seven early presidents as cannabis smokers: George Washington, Thomas Jefferson, James Madison, James Monroe, Andrew Jackson, Zachary Taylor and Franklin Pierce. Madison once remarked that hemp gave him insight to create a new and democratic nation. Cannabis was twice as popular among American soldiers in the Mexican War as in Vietnam: Pierce wrote to his family that it was "about the only good thing" about that war. American Medical Association Opposes the Marijuana Tax Act of 1937, the protest delivered to the U.S. Senate Committee on Finance, July 12, 1937. Only two questions were asked on the House floor: "What is this bill about?" The answer given by the Speaker of the House, Sam Rayburn, was, "I don't know - it's about something called marijuana - I think it's a narcotic or something." And, "What is the AMA's position?" The answer given by one of the subcommittee members (who later became a Supreme Court Justice) was, "They're behind us 100 percent." Collateral Casualties Climb in the Drug War, from the Journal of the American Medical Association, June 1, 1994. Since President Nixon declared war on drugs in 1972, the nation's primary remedy for illicit drug use has been an escalation of federal, state, and local law enforcement activities aimed at discouraging use by punishing both dealers and users. However, an increasing number of health, law, and other experts say the current policy is clearly failing and shows no sign of ever doing more good than harm. "The Consumers Union Report on Licit & Illicit Drugs," by Edward M. Brecher and the editors of Consumer Reports, Little, Brown and Company, Boston, 1972. Chapter 12, The "Heroin Overdose" Mystery and Other Hazards Of Addiction. Nothing has changed since 1972 - the government, media and medical profession are still incapable of informing the public about the most basic information. Chapter 39, The Swedish Experience. Nothing has changed since 1972 - the government, media and medical profession are still incapable of informing the public about the most basic information regarding amphetamine-type drugs. Uncannily, this chapter largely predicts the increase in America in the popularity of cocaine and then crack during the 1970s and 1980s, as well as methamphetamine and Ritalin in the 1990s. More important, it identifies the Swedish mistakes that Americans have refused to learn from. After reading "The Swedish Experience," many readers will find interesting a well-referenced 1995 update on the Swedish situation. Daily Skill Test System checks hand-eye coordination in under 1 minute, from PotPourri (a NORML periodical), February 1995. An alternative to urine-testing is available right now from Performance Factors, a division of BioFactors, Inc. Not only does Factor 1000 nab workers impaired by illegal drugs, it also detects the exponentially greater proportion of workers impaired by alcohol, lack of sleep, sickness and prescription medicines. Unlike intrusive urine-testing, Factor 1000 also allows workers to retain their dignity and their subjective sense that they still have a Constitutional right to be presumed innocent. Guess what? It's cheaper, too, and you get to play a computer game at the start of each workday. Have your Human Resources Department get in touch with these folks! We've checked out their promotional packet. Drugs Are Bad: The Drug War Is Worse, from New York magazine, Feb. 5, 1996. Today, all told, the direct budgetary costs of drug prohibition in America probably approach $100 billion yearly. The indirect costs are many times that. In fact, just as Charles Murray has argued against welfare over the last decade, one can make a strong case now that the drug war is making the crisis worse instead of better. The table of contents reads, "War by Other Means, By Craig Horowitz. As the NYPD gears up to wage total war on drug use in the city, it's worth beginning a rational debate about what will be gained by making criminals of hundreds of thousands of addicts. This country's police-and-prisons approach has proved a failure in every conceivable sense - legal, social, economic. There is a better way." A lift-out quote from the article at the top of the same page says, "The fundamental issue here is not should drugs be legalized or decriminalized. . . . The fundamental issue is should it be permissible to openly discuss the current approach?" -- Beth Israel Medical Center President Dr. Robert Newman. Dutch Provos, by Teun Voeten, from High Times, January 1990. The magazine's original table of contents says: "Ever wonder why pot is legal in Holland? Meet the guys responsible." Founded in 1965 in order to "provoke this society to its depths," the Provos were the first to combine nonviolence and absurd humor to create social change. Text version. Effects Of Smoked Marijuana In Experimentally Induced Asthma (Summary), from the American Review of Respiratory Disease, Volume 112, 1975. During the 1996 campaign for Proposition 215, California's medical-marijuana initiative, Attorney General Dan Lungren kept saying there was no scientific evidence that marijuana is an effective medicine, even after he was confronted once in Sacramento with about a dozen such studies. Barry McCaffrey, the Drug Czar, also repeated the "medical marijuana is a hoax" big lie several times. The simple truth is that there are dozens if not hundreds of studies demonstrating the medical utility of marijuana. Lungren and McCaffrey are liars. Here's a brief summary of just one study which proves it. Print it out and mail it to the next liar who says no such evidence exists. Federal Foolishness and Marijuana, from the January 30, 1997 New England Journal of Medicine. The author, Dr. Jerome P. Kassirer, is the journal's editor-in-chief. Thousands of patients with cancer, AIDS, and other diseases report they have obtained striking relief from their devastating symptoms by smoking marijuana. A federal policy that prohibits physicians from alleviating suffering by prescribing marijuana for seriously ill patients is misguided, heavy-handed, and inhumane. Marijuana may (or may not) have long-term adverse effects and its use may (or may not) presage serious addictions, but neither long-term side effects nor addiction is a relevant issue in such patients. It is also hypocritical to forbid physicians to prescribe marijuana while permitting them to use morphine and meperidine to relieve extreme dyspnea and pain. What really counts for a therapy with this kind of safety margin is whether a seriously ill patient feels relief as a result of the intervention, not whether a controlled trial "proves" its efficacy. Whatever their reasons, federal officials are out of step with the public. Federal authorities should rescind their prohibition of the medicinal use of marijuana for seriously ill patients and allow physicians to decide which patients to treat. Getting Off Drugs: The Legalization Option, from the Friends Journal, February 1996. The Quaker commitment to non-violence has direct implications for the United States' failed drug war. Health Aspects of Marijuana, from the Pharmacological Review, 1986, Vol. 38, No. 1. Leo E. Hollister's relatively lengthy overview attempted to evaluate objectively what the peer-reviewed research said about cannabis as of 1986. Some of the studies surveyed here, particularly among the few that suggested marijuana may cause some harm, were made obsolete by later research such as the 1988 discovery of THC-receptor sites in the brain. On the whole, however, subsequent peer-reviewed work has provided only more support for Hollister's overall findings. Those might be summarized by his statement that "generally toxicity studies of cannabis and its constituents lead to the inescapable conclusion that it is one of the safest drugs ever studied this way." 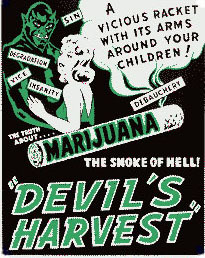 Hemp for Victory, the complete text of the 1942 film produced by the U.S. Department of Agriculture. Hempseed: Nature's Perfect Food? by Lynn Osburn, from the April 1992 High Times. The magazine's original table of contents reads: The major food companies of America don't want you to know the explosive truth about hempseed. Learn why the Russian peasants were healthy and disease-free, and how you can protect your own immune system with just one tablespoon a day. Text file. Interview: Sandee Burbank, from High Times, April 1984. The magazine's original table of contents reads: As the founder of MAMA (Mothers Against Misuse and Abuse) Sandee Burbank is fighting for a sane approach toward the problems of substance abuse by all age groups. While reefer-madness-variety parent organizations have focused almost exclusively on the demon weed and the threat it poses for today's youth, MAMA has consistently stressed the endemic nature of drug abuse in our society, calling for a total rethinking of this complex issue. Junk in the Joint: The Real Dope on the Prison Drug Scene, from the January-February 1996 "Special HBO Issue" of Prison Life magazine. The drug scene rages in prison. Dealers get rich, prisoners die of overdoses, guards are on the take and junkies walk out after years of confinement, ready to do whatever it takes for another fix. "Less than 10 percent of drugs come in through visits," says an experienced dealer who served a decade in federal institutions. "There are so many guys who catch habits in here it's not funny," says "Ringo." "Nobody can convince me that there's a county jail, a prison or any other place where people are locked up that there aren't drugs," says the former warden of East Jersey State Prison, Patrick Arvonio, 20 years on the job. Just say maybe, from Forbes magazine, June 17, 1996. For the past 20 years the Dutch have taken their own approach to the drug problems facing all developed nations. According to estimates by the United Nations International Drug Control Programme, over 7 percent of the U.S. population "abuses" cannabis, compared with under 4 percent in Holland. Various EU studies indicate that Holland has 1.6 hard-drug addicts per 1,000 inhabitants. The number compares with 2.5 in France, 3 in Italy and 5.3 in Switzerland. The U.S. wasn't included in these studies, but others show that the U.S. is still by far the largest consumer of illicit drugs, despite the continuing multibillion-dollar war on drugs. Legalizing Drugs: Just Say Yes from the conservative National Review of July 10, 1995. Legalizing drugs may be the way to help addicts, and win the drug war. An interview with Michael S. Gazzaniga, Director for the Center of Neuroscience at the University of California/Davis. Marihuana as Medicine: A Plea for Reconsideration, from the Journal of the American Medical Association, June 21, 1995, by Lester Grinspoon, MD, and James B. Bakalar, JD. In 1988 the DEA's own administrative law judge, Francis L. Young, declared that marihuana in its natural form fulfilled the legal requirement of currently accepted medical use in treatment in the United States. He added that it was "one of the safest therapeutically active substances known to man." His order that the marihuana plant be transferred to Schedule II was overruled, not by any medical authority, but by the DEA itself, which issued a final rejection of all pleas for reclassification in March 1992. It is time for physicians to acknowledge more openly that the present classification is scientifically, legally, and morally wrong. "Marihuana Reconsidered," by Lester Grinspoon, M.D., Harvard University Press, 1971, 1977. "Marihuana, The Forbidden Medicine," by Dr. Lester Grinspoon, M.D., and James B. Bakalar, J.D., 1993. Depression And Other Mood Disorders, a revised chapter from the 1997 edition. Cannabis first appeared in the Western medical literature as a suggested treatment for depression in the middle of the nineteenth century. Today, among the minority of depressed patients who do not respond to standard chemotherapy or find its side effects unbearable, some have discovered that cannabis is more useful than any legal drug. As one patient puts it, however, "It is unfair and cruel that the antidepressant that helps me most (and is probably, in its pure form, least toxic) is unavailable for legal prescription. I have to break the law to obtain it and pay exorbitant prices for a drug whose cost of production is minimal." The proportion of patients with mood disorders who would get the kinds of benefits described here is unknown. As usual, promising anecdotal evidence points to the need for more systematic clinical investigation. Elvy Musikka on Cannabis and Glaucoma, from the chapter, "Glaucoma." Musikka is one of only eight Americans who still receive marijuana leaf for medicinal purposes from the federal government's ditchweed farm at the University of Mississippi. After being arrested for cultivation, Musikka in 1988 proved conclusively that marijuana is the only thing that keeps her from going blind. Musikka and the other patients who still receive federal marijuana obliged the government to send them marijuana instead of to jail under the Compassionate IND (Investigational New Drug) program. Only a dozen or so patients were able to complete the complex paperwork required by the program between 1976 and 1989. Then the much-publicized case of AIDS patients Kenneth & Barbra Jenks led to thousands of AIDS patients applying for federal marijuana beginning in 1989. In response, the Bush administration shut down the Compassionate IND program in June 1991, asserting that saving people's eyesight and so forth undercut the administration's opposition to the use of illegal drugs. Marijuana and Immunity, by Leo E. Hollister, M.D., from The Journal of Psychoactive Drugs, April-June 1992. Few areas of scientific research have been as controversial as the effect of marijuana on immune defenses. The effects of marijuana on health in general have been marked by polarities of belief or interpretation of evidence often due to the prejudices of investigators. In addition, evidence of altered immune functions is derived mainly from in vitro tests or ex vivo experiments, which employed doses of cannabinoids far in excess of those that prevail during social use of marijuana. Dr. Hollister attempts to objectively assess the evidence from four areas of research: (1) cell-mediated immunity, (2) humoral mechanisms, (3) cellular defenses, and (4) immunogenicity of marijuana or cannabinoids. In summary, the evidence has been contradictory and is more supportive of some degree of immunosuppression only when one considers the seriously flawed in vitro studies. The closer that experimental studies have been to actual clinical situations, the less compelling the evidence. Marijuana and the Human Brain by Jon Gettman, former director of national NORML, from the March 1995 High Times. (Clicking on the two black-and-white illustrations will enlarge them.) This is a fascinating and memorable account of research leading to the 1988 discovery of THC-receptor sites in the brain, and the subsequent studies showing why marijuana is not addictive and is not a drug of abuse. The magazine's original table of contents says, "All of marijuana prohibition rests on the premise that marijuana is potentially addictive. But the 1988 discovery of receptors for THC in the human brain is forcing the scientific community to rethink its position and may ultimately lead to cannabis legalization." The author filed a petition with the DEA on July 10, 1995 in accordance with the Controlled Substances Act, stating the case for removing cannabinoids from Schedules I and II. The DEA accepted the petition for filing on July 27, 1995. After more than two years of delay, in January 1998, the DEA finally had to admit Gettman had grounds for his case, and was obliged to send his petition to the Department of Health & Human Services for an official scientific evaluation. This article explains Gettman's scientific case. NORML originally issued a press release about Gettman's petition on July 11, 1995. Information about 1998 developments begins here. The archive of related documents titled "Marijuana, Science and Public Policy" has finally been re-posted by Gettman at the High Times web site. Marijuana Arrests For 1996 Most In Nation's History, from Ongoing Briefing, October 1997. This article, which Portland NORML is the first to post on the Web, is the first found in years of searching that documents the numbers of annual arrests for marijuana nationwide all the way back to 1965. State and local law enforcement arrested a record 642,000 men and women on marijuana charges in 1996, according to the latest edition of the Federal Bureau of Investigation's (FBI) Uniform Crime Report. Marijuana arrests have risen 80 percent since 1990. Presently, the total number of marijuana arrests under the Clinton administration stands at approximately 2.1 million. The drastically rising number of marijuana arrests suggests that law enforcement officials are specifically targeting marijuana smokers. According to annual data from the U.S. Department of Health National Household Survey on Drug Abuse, marijuana use among adults has remained relatively stable throughout the 1990s. Text file. Marijuana as Antiemetic Medicine: A Survey of Oncologists' Experiences and Attitudes (abstract) Journal of Clinical Oncology, July 1, 1991. In a 1990 survey, 44 percent of oncologists who responded said they had suggested that a patient smoke marihuana for relief of the nausea induced by chemotherapy. Marijuana: Medical Papers (1839-1972), the "Introduction" from the out-of-print classic by Dr. Tod H. Mikuriya. This "Introduction" surveys the history of marijuana as a medicine, particularly Western medical literature since 1839, when cannabis first entered the pharmacopoeia. The table of contents also links to several chapters that have been posted elsewhere. Dr. Mikuriya, now a Berkeley psychiatrist in private practice, took his undergraduate degree at Reed College here in Portland in 1956. In the 1960s he worked for the National Institute of Mental Health as the person in charge of marijuana research and subsequently was a consultant to the National Commission on Marijuana and Drug Abuse. Dr. Mikuriya has authored several essays on a variety of marijuana topics, including "Marijuana in Morocco," "Marijuana in Medicine, Past Present, Future," and "Historical Aspects of Cannabis Sativa in Western Medicine." His 1969 study on "Cannabis Substitution as an Adjunctive Therapeutic Tactic in the Treatment of Alcoholism" is included in the "Marijuana: Medical Papers," as well. Dr. Mikuriya wrote "Marijuana: Medical Papers" after quitting his government post following pressure from superiors to distort the record. Marinol: The Little Synthetic That Couldn't, from High Times, July 1994. Marinol is not marijuana. The magazine's original table of contents reads, "The government claims marijuana has no medical value, yet has spent millions developing synthetic THC to treat the same illnesses for which marijuana is allegedly useless. What's going on? A scam." Middle age, not marijuana, blamed for memory lapses From the Rochester Democrat & Chronicle, Aug. 8, 1994. Alcohol, on the other hand, can easily cause brain damage. Misfire On Drug Policy, by William F. Buckley, Jr., in The National Review, Feb. 26, 1996. Buckley writes: "A look at the formal side of the war on drugs is required. If something is illegal, then the law that makes it so is effective to the extent that it imprisons those who violate it, thereby hypothetically reducing the number of lawbreakers. That would seem obvious, but isn't to the distinguished members of the Council on Crime in America. In 1985, 811,000 arrests were made for drug offenses. In 1994, 1.35 million arrests were made for drug offenses. Does that mean that the war on drugs is effective? Well, no. An effective law diminishes, rather than increases, the number of violators who have to be arrested." The Nation's Correctional Population Tops 5 Million, Aug. 27, 1995, a press release from the U.S. Department of Justice. "The Natural Mind," by Andrew Weil (1973). Whatever your current beliefs about "drugs," the first two chapters from this out-of-print classic will likely change your entire outlook. Chapter 1, What This Book Is About. Everything you know about "drugs" is wrong. But don't despair - a new perspective is available offering solutions to the drug problem. Chapter 2, Why People Take Drugs. The urge to alter consciousness seems to be innate and normal to humans. Like the cyclic urge to relieve sexual tension, the urge to suspend ordinary awareness arises spontaneously from within - and can begin at an early age, for example when 3- and 4-year-olds whirl themselves into vertiginous stupors. New Billion-Dollar Crop, from the February 1938 Popular Mechanics. "Hemp is the standard fiber of the world. It has great tensile strength and durability. It is used to produce more than 5,000 textile products, ranging from rope to fine laces, and the woody "hurds" remaining after the fiber has been removed contain more than seventy-seven percent cellulose, and can be used to produce more than 25,000 products, ranging from dynamite to Cellophane." The Partnership: Hard Sell in the Drug War, The Nation, March 9, 1992. The Partnership for a Drug-Free (sic) America sends a self-serving message. The ads themselves exaggerate and distort, relying on scare tactics to get people's attention. Ad strategies are based on market research rather than public health policy. Even worse, the Partnership has accepted $5.4 million in contributions from legal drug manufacturers, while producing ads that overlook the dangers of tobacco, alcohol and pills. This "drug-free" crusade is actually a silent partner to the drug industry, condoning the use of "good" drugs by targeting only the "bad" ones. Prenatal Marijuana Exposure and Neonatal Outcomes in Jamaica - An Ethnographic Study, from Pediatrics, February 1994, Volume 93, Number 2. Ellen Komp writes: Lots of commentators advise against smoking while pregnant - however they are almost universally males who have never had to undergo morning sickness! One tragic ill effect of the illegal status of marijuana is the difficulty it creates in performing scientific research into marijuana's physical effects. As a woman, I feel particularly robbed by the lack of studies into cannabis use during childbirth, to relieve morning sickness associated with pregnancy, and for the pain and discomfort of menstrual cramps and PMS. (Strong cannabis tinctures have been used during labor since at least 2,000 B.C., and even prudish Queen Victoria used it to relieve her menstrual cramps.) It has occurred to me that since many women suffer from severe morning sickness while pregnant, and since cannabis is perhaps the most effective anti-nauseant known, using the herb might allow pregnant women to better nourish themselves, possibly improving the health of their children. Yet women in this country often cease smoking marijuana when they become pregnant, because they do not feel enough is known about what effects the herb may have on their child. Research sponsored by the March of Dimes was conducted in Jamaica, where alcohol and tobacco are used only minimally by women, the first such study done outside of the United States and Canada. The study tested 24 Jamaican newborns exposed to marijuana prenatally and 20 nonexposed babies from socioeconomically matched mothers. At one month, the children of marijuana-using mothers scored markedly higher on autonomic stability, reflexes, and general irritability. Babies born to the heaviest smokers, those who smoked every day, at least 21 joints weekly, scored significantly higher in 10 of the 14 characteristics measured, including quality of alertness, robustness, regulatory capacity, and orientation. No ill effects from marijuana were found, and quite possibly there were dose-related positive effects. The researchers recognize the preliminary nature of the study, but go so far as to speculate that, "It is possible. . . that the outcomes at one month are related to neonatal exposure to marijuana constituents via breast milk. ..." Nineteen of the 24 Jamaican mothers reported that cannabis increased their appetites throughout the prenatal period and/or relieved the nausea of pregnancy. Fifteen reported using it to relieve fatigue and provide rest during pregnancy. It is also possible that these positive effects were responsible for their developmentally superior babies. Psychoactive Substances and Violence, by Jeffrey A. Roth, U.S. Department of Justice, February 1994, states that "Of all psychoactive substances, alcohol is the only one whose consumption has been shown to commonly increase aggression." Research Findings on Medicinal Properties of Marijuana, January 1997. Kevin B. Zeese of Common Sense for Drug Policy reviews more than 70 research papers filed with the Food and Drug Administration since 1970 documenting the efficacy of cannabis in treating a variety of serious medical disorders, demonstrating that doctors have a basis for recommending marijuana as a medicine to some patients. Savings In California Marijuana Law Enforcement Costs Attributable to the Moscone Act of 1976 - A Summary, from The Journal of Psychoactive Drugs, January-March 1988. The complete summary from the paper by Michael R. Aldrich and Dr. Tod H. Mikuriya, showing that decriminalizing possession of marijuana saved California at least $1 billion between 1976 and 1985. One could reasonably infer the law saved the state at least another $1 billion between 1986 and 1997. The study also notes, "One billion dollars should be considered a minimum estimate of savings because the present study did not include savings in the cost of county jails, prosecutors, public defenders, probation departments, misdemeanor court dispositions, juvenile facilities, or peripheral parts of the criminal justice system involved with marijuana law enforcement, such as the cost of collecting statistics. Nor were any savings in expenditures by individual arrestees or defendants considered." Text file. Study may undercut marijuana opponents - Report says THC did not cause cancer, from the January 30, 1997 Boston Globe. A federal study left on the shelf for two-and-a-half years showed the main active ingredient in marijuana did not cause cancer when fed in huge doses to laboratory animals over long periods, and may even have protected against malignancies. The 126-page draft study, which undercuts federal officials' contention that marijuana is carcinogenic, has never been published, though a panel of expert reviewers found in June 1994 that its scientific methods and conclusions were sound. Study Questions Justice System's Racial Fairness, from the Los Angeles Times, Feb. 13, 1996. Nearly four in 10 of California's young black men were under some form of criminal justice control last year. By comparison, the rate was about one in 10 for young Latino males and one in 20 for white men. African Americans are charged under California's "three-strikes" drug laws at 17 times the rate of whites in Los Angeles and 13 times the rate of whites in San Francisco. Survey: Drug Tests No Deterrent, from the Eugene Register-Guard, April 21, 1996. "Costs have increased tenfold since 1990 with very little statistical evidence of results," said Eric Greenberg, who conducted the survey for the American Management Association. "No finding of our survey efforts can confirm with statistical certainty that testing deters drug use." Test Negative -- A look at the "evidence" justifying illicit-drug tests, from the March 1990 Scientific American, uses the drug-warriors' own evidence to show that workers who tested positive for marijuana only: 1) cost less in health insurance benefits; 2) had a higher than average rate of promotion; 3) exhibited less absenteeism; and 4) were fired for cause less often than workers who did not test positive. Since marijuana is the most common illicit drug used by adults, and the one detected in up to 90 percent of all "positive" urine tests, this article still has profound implications for current public and employer policies. Weeding Through the Hype: The Truth About Adolescent Marijuana Use, from Ongoing Briefing, June 1996. According to politicians, prohibitionists, and the mass media, adolescent marijuana use is dramatically on the increase. However, a closer look at the raw data reveals little evidence to support such claims. Consequently, it appears the latest round of "reefer madness" is nothing more than a ploy to encourage legislators to once again stiffen penalties against adult users. "Our national drug strategies are based on unsubstantiated and insufficient information," charged Rep. John Conyers (D-Mich.) after reviewing a 1993 G.A.O. report. "It is impossible to determine [from these surveys] whether ... high school student drug use has been decreasing, increasing, or remaining stable." The Wormscan Files, compiled by David P Beiter, updated here August 1997. A brief directory links 40 files (previously 32 - some of them quite long; check before downloading or printing), a mind-boggling 3.4 megabytes (previously 2.6 megabytes) of news and magazine articles, interviews, transcripts and other information documenting police and government corruption attributable to drug prohibition. This is the first time this unrivaled compendium of venality and hypocrisy (and now its update) has been posted in its entirety on the web. Links to text files can be found at the bottom of the directory page, "COVER.LTR." Beiter writes, "...the new versions are intended to replace the old versions ....All old information is in the new files, with the exception of minor corrections." Except for the information at the very top and bottom of each page, and one or two other clearly denoted exceptions, all editing you read beyond this point is Beiter's.